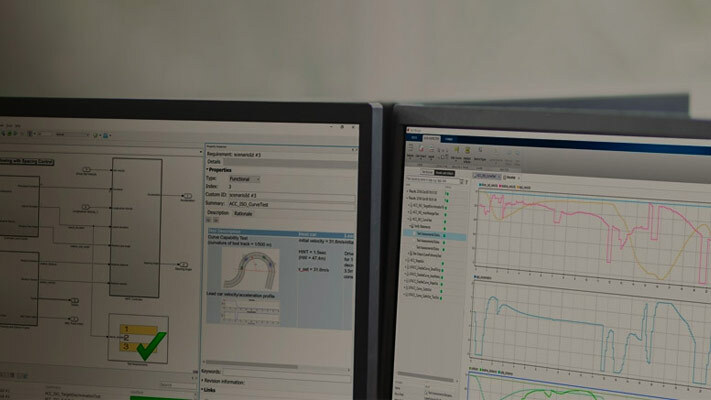 Simulink® Coverage™ performs model and code coverage analysis that measures testing completeness in models and generated code. It applies industry-standard metrics such as decision, condition, modified condition/decision coverage (MCDC), and relational boundary coverage to assess the effectiveness of simulation testing in models, software-in-the-loop (SIL), and processor-in-the-loop (PIL). You can use missing coverage data to find gaps in testing, missing requirements, or unintended functionality. Simulink Coverage produces interactive reports showing how much of your model, C /C++ S-functions, MATLAB® functions, and code generated by Embedded Coder® has been exercised. You can highlight coverage results in blocks and subsystems to visualize gaps in testing. To assess testing completeness, you can accumulate coverage data from multiple test runs. You can apply filters to exclude blocks from coverage and justify missing coverage in reports. Support for industry standards is available through DO Qualification Kit and IEC Certification Kit .